While multi-million dollar sponsorships and agencies snapping up the rights to sell them are common in NCAA intercollegiate athletics, other brands see a growing opportunity in intramural athletics. 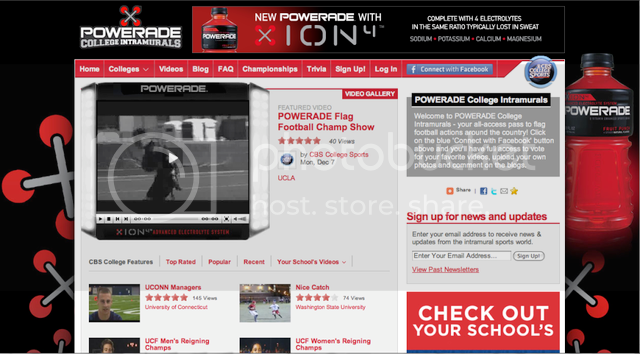 That's right the bastion of bad uniforms, loosely officiated contests and epic post-game parties is getting interest from blue chip brands like Powerade, as well. Matt Schommer profiles Powerade's intramural sponsorship program in today's edition of The Daily Iowan, the University of Iowa's campus paper. Powerade has sponsored Iowa's IM program for the past three years and has expanded its partnership program to hundreds of schools nationwide, hiring on campus student representatives to manage the campus activation. For instance, UI's flag football teams get free drinks, headbands, towels, banners, flags, T-shirts and a social networking website, powered by CBS College Sports. “I expect that the core users, mainly athletes, have been exhausted,” said Lopo Rego from the UI College of Business. One place you might not expect to see Powerade? Florida, which is ground zero for rival, Gatorade. Gary Cahen, assistant director of intramural sports at the University of Central Florida, tells Schommer there hasn't been much of a backlash to their deal with Powerade. While many students enjoy getting a free bottle or T-shirt, that doesn’t mean everyone is completely sold on Powerade’s presence.